Thanksgiving Day in the United States abounds with historic images of black-hatted, silver-buckled Pilgrims joining Native Americans in an outdoor New England feast of wild fowl, fish and grain. Certainly today's Thanksgiving feast is inspired by the traditional stories about the Pilgrims, but this celebration isn't exactly the very first American Thanksgiving. Consider this: The 1564 French Huguenots in Florida ... the 1598 Spanish conquistadors near present-day El Paso ... the 1610 Virginia settlers of Jamestown – they all hold claim to celebrating the "first" Thanksgiving in North America before the arrival of the Pilgrims in Massachusetts. After building Fort Caroline to establish a settlement on the St. John's River near Jacksonville, French Protestants joined with local Indians in celebration. This simple event involved a modest feast, prayer and music. One of the French officers wrote: "We sang a psalm of Thanksgiving unto God, beseeching Him that it would please His Grace to continue His accustomed goodness toward us." But due to conflict with Spain over possession of the territory, the settlement was destroyed within a few years. Led by Juan de Onate, an expedition of about 500 crossed the Chihuahuan Desert to reach the Rio Grande River. After their harrowing journey across the wasteland, they rested on the banks of the river, offered thanks to God and feasted. Their journey and colonization was the start of European settlements in the American Southwest. The early years of the Jamestown settlement were marked by famine, disease and death. After the winter of 1609-1610, a population that had reached nearly 500 was reduced to about 60 settlers. When ships arrived carrying food in the spring of 1610, the settlers responded with a spontaneous prayer service. In November of 1620 after a voyage totaling more than 3,000 miles, dissenters from the Church of England, commonly known as Pilgrims, landed at Cape Cod to establish a new settlement and exercise religious freedom. The first winter and spring was a trying time for the colonists as disease, cramped quarters and bitter cold all took a toll. In the early months of their quest, 50 of the 102 settlers died with only a handful remaining unscathed by the harsh environment.4 By the summer and autumn of 1621, the Pilgrims rebounded and gathered a bountiful harvest while enjoying plentiful fishing and hunting. Nearly 100 Native Americans joined 52 Englishmen to feast for three days to celebrate the harvest and God's blessings. Thanksgiving proclamations were sporadically made by presidents and governors, but in 1863, President Abraham Lincoln established a day for giving thanks as a national tradition. Desiring to unite a nation torn apart by war, Lincoln wrote of prosperity, population increase and emerging harmony as signs of God's mercy even in the face of battle. This president called all Americans to "a day of Thanksgiving and Praise to our beneficent Father who dwelleth in the Heavens," while asking God to bring peace as well as to tenderly care for widows, orphans and all those who were suffering because of the Civil War. Americans are a unique combination of diverse cultures and traditions, evidenced by several competing "first" Thanksgivings. Our nation has a rich heritage that recognizes God's sovereign rule, offering gratitude to Him even in times of adversity. 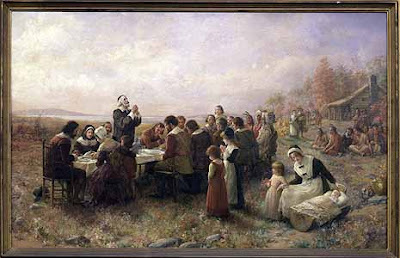 Thanksgiving to God is the common element that links the early French, Spanish and English settlers as well as Americans of the Civil War period. No matter where you are or whatever your needs, take time to be grateful. When we come to God with our requests and concerns filtered through thanksgiving, the Bible makes it plain – we will receive the peace only He can give, a peace that passes all understanding. Remember what the apostle Paul wrote, while chained under house arrest, "Do not be anxious about anything, but in every situation, by prayer and petition, with thanksgiving, present your requests to God. And the peace of God, which transcends all understanding, will guard your hearts and your minds in Christ Jesus" (Philippians 4:6-7 NIV).